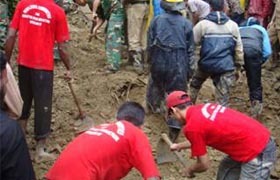 11 people were killed in a rain-induced mudslide at Matijharna in Chittagong city on 18 August. The mudslide destroyed 14 houses of a slum built. YPSA’s Community Voluntears helped fireman to recover the bodies.